It has long been known that natural viruses can infect and kill cancer cells. In the last 2 decades many advances in genetic engineering of viruses now allow design and construction of viruses highly specific for infection, replication within, and killing of many cancers. One of these (Tvec- Talimogene laherparepvec) was recently approved as the first gene therapy approved for clinical use in the US. In this talk, we will review the history of this field of Oncolytic Viral therapy. Also reviewed will be the most important design principles for virus, trials, and correlative studies. Yuman Fong, M.D. is the Chair of the Department of Surgery at City of Hope National Medical Cent. 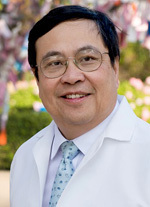 Dr. Fong's superb abilities as a physician and surgeon, his commitment to educating the surgeons of the future and his remarkable creativity and productivity as a researcher all make him an excellent match for City of Hope's mission and values, and an ideal leader for the Department of Surgery. Prior to joining City of Hope, Dr. Fong held the Murray F. Brennan Chair in Surgery at Memorial Sloan Kettering Cancer Center in New York while also serving as a professor of surgery at Cornell Medical College. He has been a pioneer both in the operating room and in the laboratory, crafting new surgical techniques and instruments and creating entirely new treatment methods. Especially notable is his track record of launching human clinical trials of genetically modified viruses with the potential to fight cancer. Dr. Fong has authored more than 600 peer-reviewed articles, including more than 200 basic scientific articles, and over 350 clinically oriented peer-reviewed publications, which have appeared in Nature, New England Journal of Medicine and Journal of Clinical Investigation, among others. He has served as author and editor of 11 textbooks as well as 65 book chapters. Dr. Fong has received grant support as a principal investigator continuously over the past 17 years, most from the National Institutes of Health (NIH), and has been awarded five patents related to his work. He has served on the editorial boards of 14 journals and has received numerous honors and awards including the Franklin Martin Faculty Fellowship from the American College of Surgery and the Shipley Award from the Southern Surgical Association. Dr. Fong recently completed a two-year term as chair of the recombinant DNA advisory committee of the NIH.